Angry Robot Books recently provided an opportunity to members of the Angry Robot Army to conduct email interviews with various Angry Robot authors. I was pretty keen to interact more with some of the authors whose works I've been able to explore thanks to the review program. 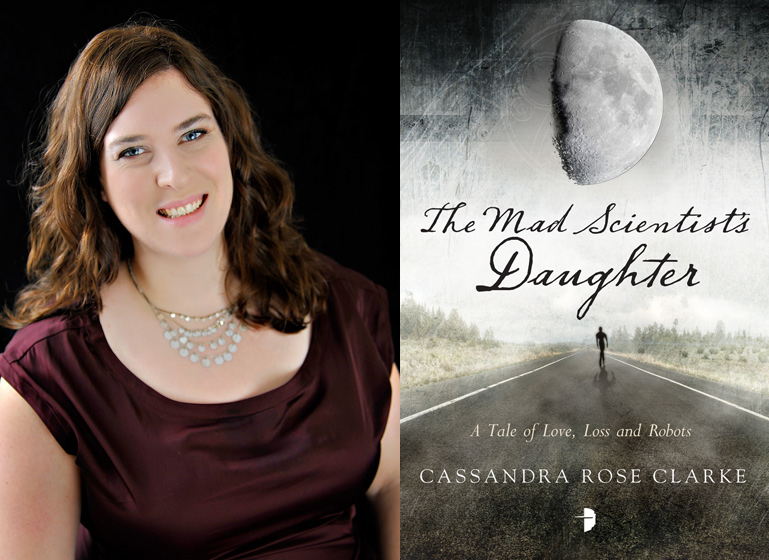 So the first interview is with Cassandra Rose Clarke, author of the surprisingly compelling The Mad Scientist's Daughter. I wasn't quite sure what the book was going to be about at first and was completely drawn into the complex tale of a forbidden love, the nature of humanity and an interesting view of the future. I'm really glad that Cassandra agreed to participate in this interview program - her answers are a lot of fun! I really enjoyed your "fun bio" on your website! Given your diverse lists of favorites, do you feel there were key aspects of these things that you love that helped shape The Mad Scientist's Daughter? CRC: Oh, absolutely! Star Trek: The Next Generation is probably the most obvious influence on Mad Scientist’s Daughter; Finn is pretty similar to Data, and the idea of a android not wanting to be human was one of the big things I wanted to explore in the book. But I think you can see evidence of some of my other favorites, too. With Mad Scientist’s Daughter, I was definitely attempting to capture some of the stylistic beauty of The Great Gatsby, the epic scope in the Blind Assassin, and the tragic, beautiful romance in 2046. Actually, the more I look at my fun bio, the more convinced I am that every thing on there shines through in MSD, even if it wasn't intentional. I think even a little bit of Harriet the Spy crept into young Cat, for example. I was really surprised at the scope of the novel - starting from Cat being a child and following her as she grew up. What made you approach the story in this fashion? CRC: I’ve always loved books with that kind of scope—they have an epic feel to them, but at the same time they’re deeply personal in a way that something like, say, A Song of Ice and Fire isn't (although ASOIAF is certainly epic). It’s a scale that I tend to gravitate towards when I write novels, because I like being able to delve deep into a particular character, and one of the ways you can do that is by looking at how that character was when they were child, since those experiences will always shape us as adults. Another thing I appreciated was the sort of "soft dystopia" that novel was set in. There were some mentions of things that had happened but we never really got too specific a out the details. Was there a specific reason you sort of "muted" this aspect of the back story? CRC: Probably the big reason why I downplayed the dystopic nature of the worldbuilding (“muted” is a good word for it!) was because it didn’t feel realistic to me for Cat to spend so much of her time dwelling on the world. She lives in it, she’s aware of it—but at the same time, she has the privilege of being able to slip away to a house in the woods and not have to think about it all that much. So I wanted to hint at this world on the edge of Cat’s periphery, and suggest that there was much more to the world than what we’re seeing with Cat and Finn’s story. The depth and complexity of Finn surprised me, especially as the story drew to a close. Was there a particular inspiration for how you approached writing Finn? CRC: Like I mentioned earlier, I was influenced by Data on Star Trek—it’s always struck me as interesting that an android would so desperately want to be human, and that an android would want emotions. Emotions can be pretty terrible things sometimes, a concept that Star Trek never really fully explored. So I wanted to take that core idea and twist it around and see what new angles I could find. It was difficult writing Finn, though, because I had to second-guess every decision I made about him. I wanted him to be complex but I also didn't want him to ever seem too human, either. I had to ask myself: Is this something a robot would do? And if it wasn't, then I had to look at ways to adapt it. Do you have future plans of revisiting the setting of this novel? And while I think the character of Cat has already had a full narrative, I can't help but feel that there are more stories to be told in this not-so-distant future version of Earth. CRC: You know, I’d never really considered that possibility before, but now that you mention it… I think I agree! Cat’s story is finished, like you said, but it would be fun to return to that world and examine all the different pieces of it that Cat didn't or couldn't see. And that's our little interview! If you're interested in getting your own copy of The Mad Scientist's Daughter or any of Clarke's other books, they're readily available via the Angry Robot Trading Co. site or via major retailers like Amazon. The ebook copies go for about $6-8 depending on the site or the day.